The Devil's Garden Primitive Loop trail in Arches National Park is a world class hiking experience that provides a unique variety of arches and natural rock formations. The first mile of the trail, to Landscape Arch, is well groomed and relatively easy to hike. 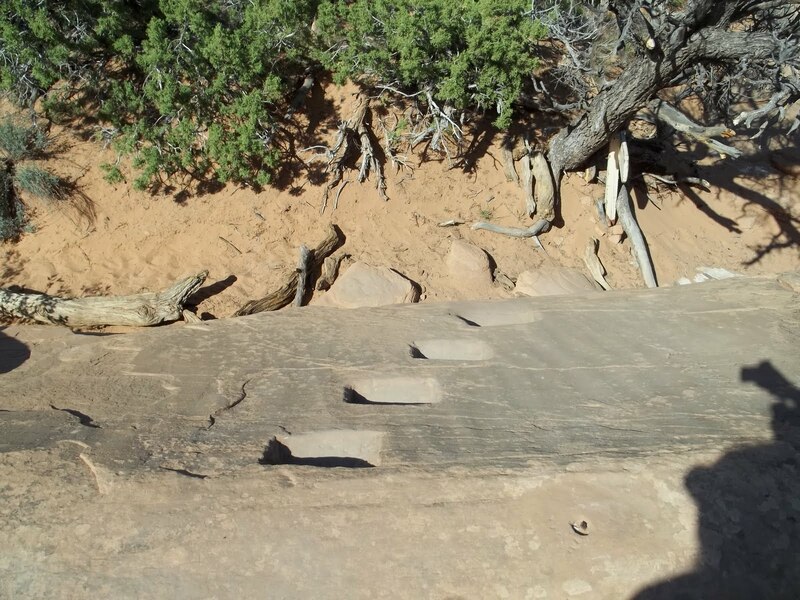 The trail becomes much more primitive from that point with some sections of trail that require crossing narrow rock fins and scrambling over areas of slickrock. There are places from which a fall may prove to be deadly but for the most part they are easy to avoid or deal with. I have taken members of my family on the entire hike, and Boy Scout troops on several occasions, without any trouble. I recommend having an experienced and skilled hiker to supervise any such group. With that said, I have seen two apparent septuagenarian lady hikers who seemed to be having an enjoyable time with their hike and taking each obstacle in stride. The hike begins at the Devil's Garden trailhead. As you can see from the towering rock fins that the beginning of the trail passes through, this would be a fun hike even if there were no arches to see along the way. It can get extremely hot here in the summer months so be sure to take plenty of water with you. Just under one mile from the trailhead you come upon the famous Landscape Arch. This frail looking arch measures an incredible 306 feet from base to base with an upper span of 290 feet. They closed the trail that led under the arch in 1991 when a massive amount of rock fell from the underneath side on the right. A visitor actually captured a video of the event. 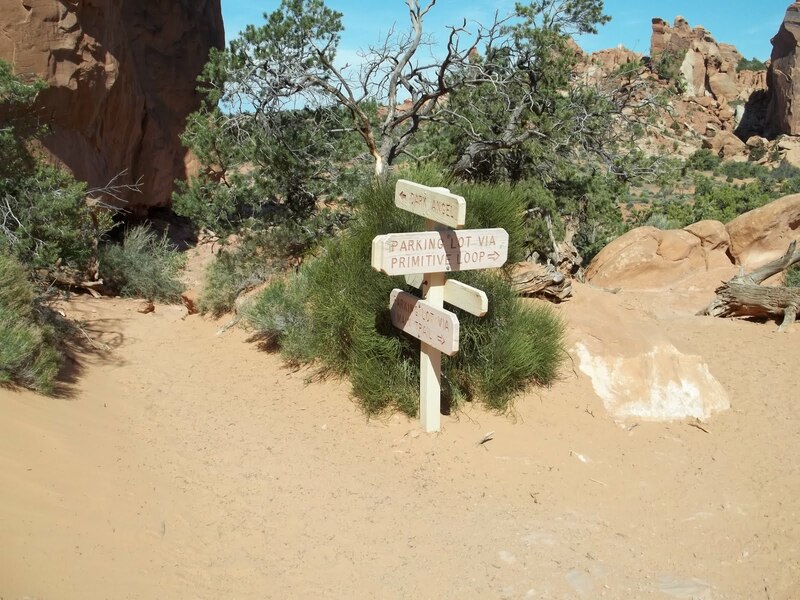 There is a trail sign just past Landscape Arch that shows a distance of 1.2 miles to Double O Arch. 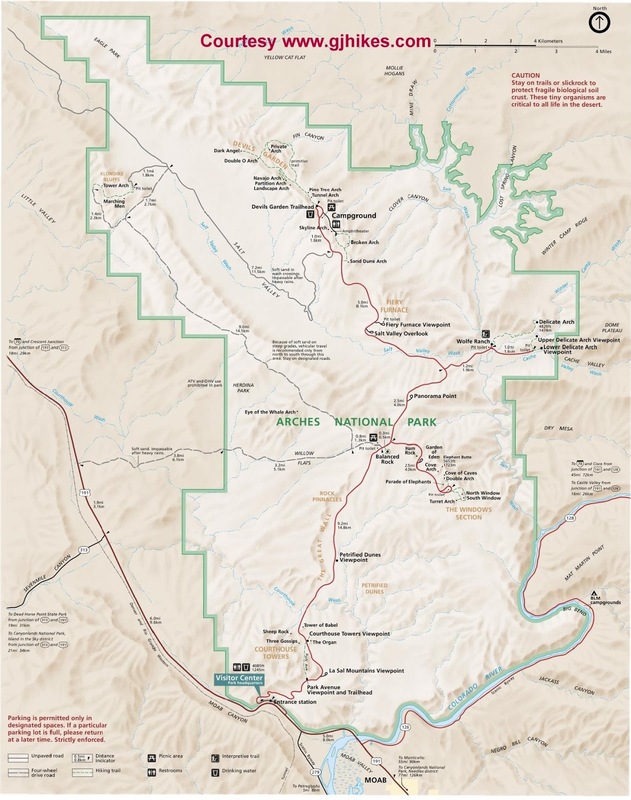 That distance doesn't take into account a visit over to Navajo Arch or Partition Arch. 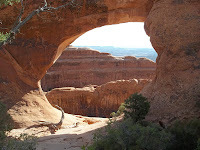 Those two arches are a 'must see' and will add about 1 mile of hiking to the Double O distance. 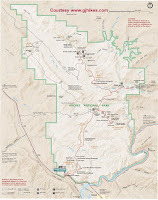 Up until August 4th of 2008 the trail passed to the west of Wall Arch. Wall Arch collapsed sometime during the night on that date and totally blocked the trail. 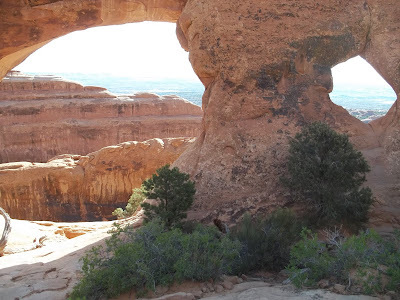 When the trail was reopened it was routed up and over a rock fin on the east side of the fallen arch. This new route isn't all that difficult, with the little bit of scrambling that it adds, and it provides a good example of some of the further difficulties that lie ahead. To do the out and back for Navajo Arch and Partition Arch you need to double the distances shown on the sign. 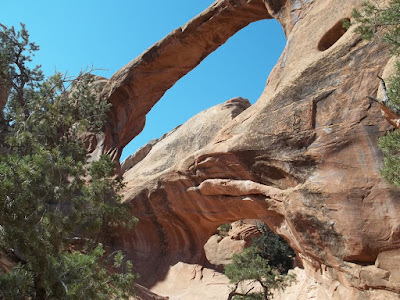 The hiking to those two arches is very easy, and fun, and the arches are well worth seeing. 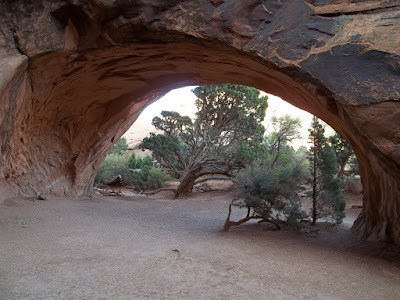 When you come upon Navajo Arch it is like entering a secret garden. The picturesque little arch looks like one of the sturdiest arches in the park. That's good because you can walk right under it. 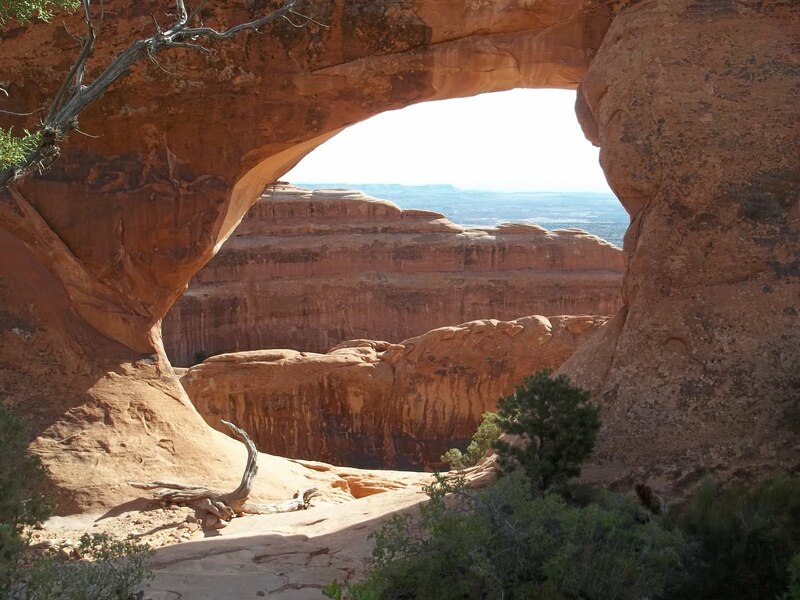 Partition Arch is a window through which you can get good views of the La Sal Mountains, to the east, and other sections of Arches National Park. 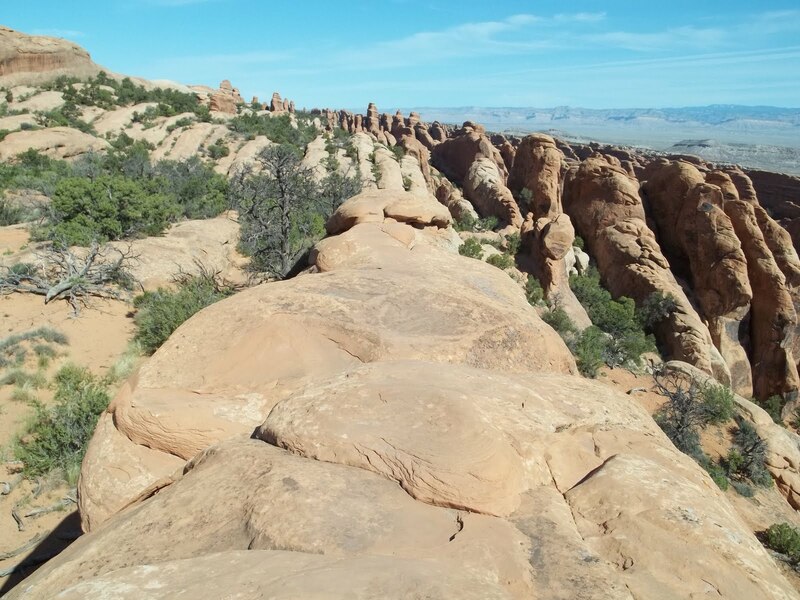 After returning to the main trail and continuing on towards Double O Arch you are treated with some spectacular views of Devil's Garden where one rock fin after another are lined up in succession. If you continue to follow the trail on around you will soon be hiking through that area. 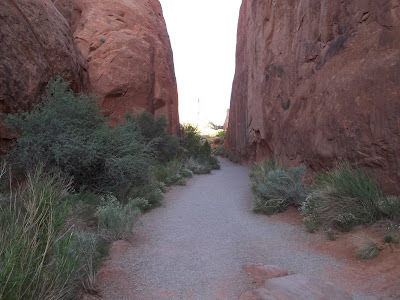 The trail to Double O Arch crosses one of the rock fins. The narrow slab of rock is plenty wide enough to cross comfortably. It is just enough to add an air of adventure to the hike without you having to be an expert at rock climbing. Towards the end of the fin there are some steps carved into the rock so you don't have to slide down the sandstone. It is probably only about 10 feet from the top of the rock to the trail below. 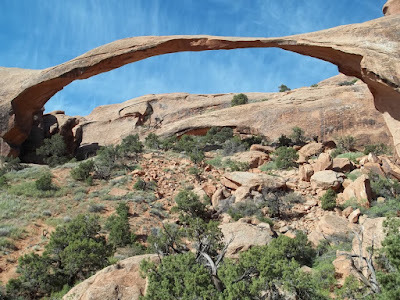 If you look carefully at the picture of Double O Arch you can see that there are two arches, one on top of the other. I have seen some adventurous people in the past climb up and walk across each one of them. This is one of the nice places along the trail to pull up a rock and enjoy a rest stop. 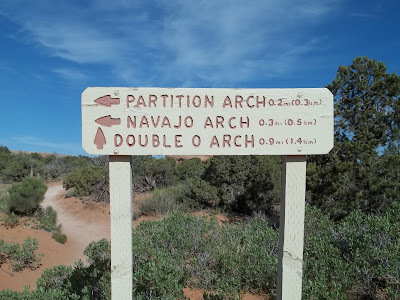 Just past Double O Arch is a fork in the trail where you can hike the out and back over to Dark Angel or continue along on the Primitive Trail. The hike over to Dark Angel adds about 1.4 miles to the total distance. 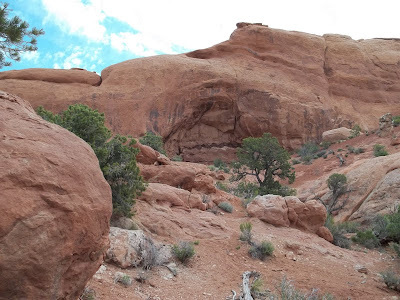 The trail drops down the hill from Double O Arch and then climbs back up to the Dark Angel monolith. That all has to be repeated, of course, to get back to the Primitive Loop. The Primitive Trail is easy enough to follow in the sandy sections. Where the trail crosses the rock fins there are plenty of cairns to keep you on the right path. A couple of those rock fins you pretty much have to get low and scoot down. I have seen people hike this trail in the opposite direction and it can be a lot harder to climb up the rock than slide down it. The big hole that you can't miss in one of the fins is called High Window. 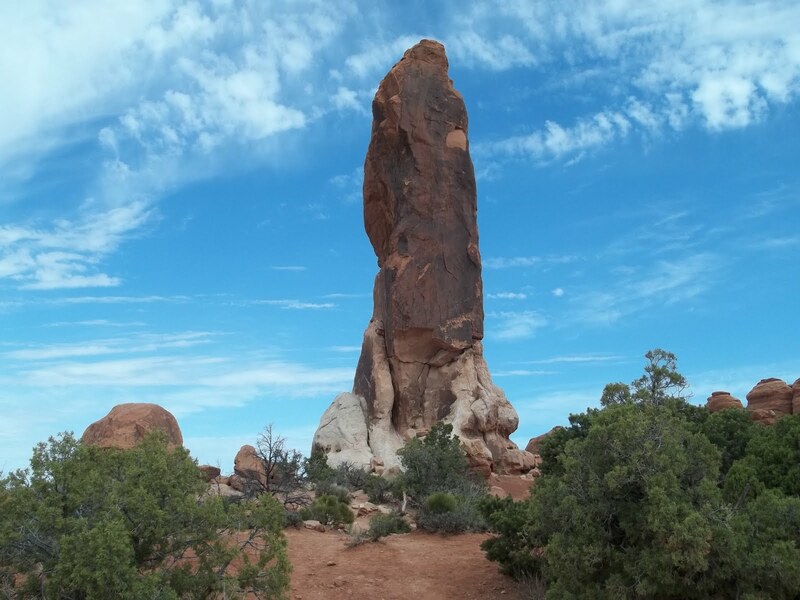 Here is a good picture looking towards a closely grouped section of fins in Devil's Garden. These are some of the fins that we were looking down upon earlier before getting to Double O Arch. Portions of the trail are delightful to hike where it follows the meandering wash that wraps around the base of the cliffs. There are a few short drop offs that often times hold pools of water that are fun to navigate around. Eventually the trail climbs out of the wash and makes its way up, over and around to the main trail by Landscape Arch. A short distance from the trailhead is another out and back hike to Pine Tree Arch and Tunnel Arch. 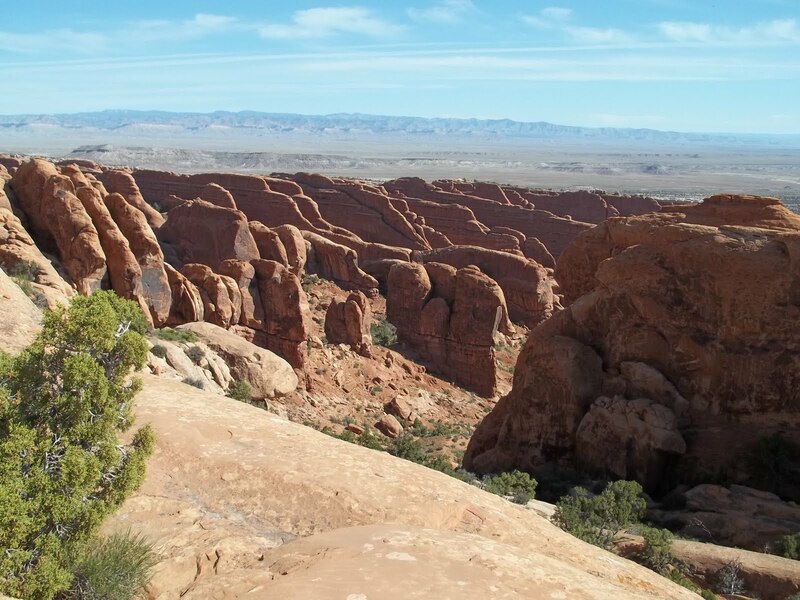 There are other arches, that you can see, off in the distance in places that don't have any trails leading to them. Most of the bighorn sheep around Arches are near the entrance of the park. I spotted these across the highway just before coming down the hill to the park entrance. It was mating season and they are all bunched up. This herd had a couple of rams, about a dozen ewes and 3 or 4 yearling lambs. Arches is a good place to hike year round. You really have to bring a lot of water in the summer months though. If you want to do all the hikes and see all there is to experience in Arches National Park you will probably have to give yourself a couple of days to make the most of it. If you would like to see it for yourself then all you have to do is 'Take a hike'.